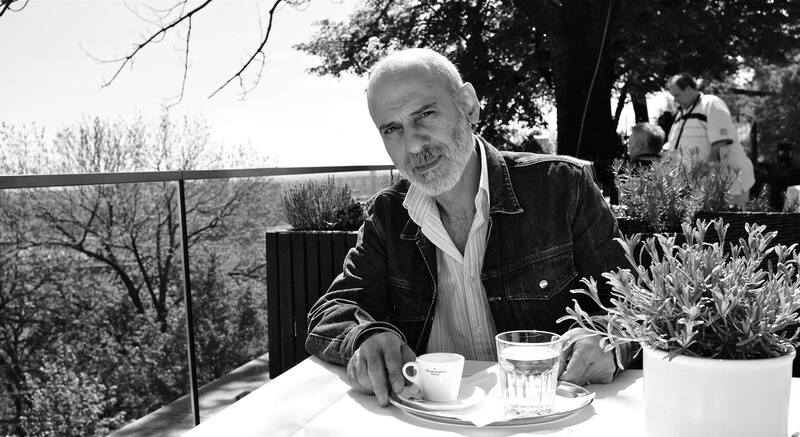 Mohammad Habeeb (b.1961) is a Syrian translator, poet, and writer. He holds a Bachelor of Arts from the English department of Tishreen University in Lattakia, Syria. After more than fifteen years’ experience as a translator and interpreter (working primarily in Arabic and English), Habeeb has translated a number of well-known literary and theoretical works, including the writings of T.S. Eliot, José Saramago, Khaled Hosseini, James Kelman, Carl Gustave Jung, Erich Fromm, Terry Eagleton, and Moris Farhi. Habeeb has worked as a teacher in Syria, teaching writing and translation techniques to junior university students. For the past ten years, he has been working as a freelance translator, and continues to conduct research, translations, and aids in drafting campaigns for Reprieve, a UK-based charity organization. He is a member of the Syrian Writers Union, a society for translators, and he also works as an editor and advisor to a publishing house in Lattakia. In 1989, Habeeb co-founded the Committee for the Defence of Democratic Freedoms and Human Rights in Syria (CDF), and became the co-editor of the organization’s underground magazine, The Voice of Democracy. CDF was primarily established to repeal Syria’s state of emergency from 1963, when the Baath party came into power as the result of a military coup. In 1991, Habeeb was arrested together with several other activists, and sentenced to 9-10 years’ imprisonment for their activities. Even after his release, Habeeb continued to be persecuted, and was denied basic civil rights; he was unable to work or practice any public profession after his incarceration. In the wake of the Arab Spring in 2011, Habeeb co-founded, and was a leading member of Maan (Together), a movement to accompany the Revolution in Syria, and support the peaceful demands of Syrians (2011-2013). Although Habeeb’s career now centers around translation and literature, it began as one steeped in politics, activism, human rights, and freedom of expression. He names his most defying issue, and a highly sensitive one: how to remain true to himself, to keep his sense of identity intact and ever-improving in a demoralizing and often disheartening political climate. Imprisoned for nearly a decade, Habeeb seems understandably disillusioned with the role of politicians and media in contemporary society. He warns of the frenetic, continuous changes in the world around us, and expresses a legitimate worry that we have to be at constant attention lest we be pushed onto an undesirable path from which we will not recover. For the most part, he comments, “mass media […] is being used to reshape everything all over the world”, leaving us at the mercy of the will of big decision-makers. “They tell us what to eat, drink, wear, and what gifts to offer each other”, and we imbibe these distractions because of our desire to be up-to-date and accepted. Habeeb contends, “they give us all those details to sort out; meanwhile, they are making wars and accumulating wealth from others’ blood”. […] We should not trust politicians to formulate our future”. Rather, he argues, we should participate in the decision-making process, and push and fight for our voices to be heard, to ensure we are creating a world we will enjoy. Before he began any physical travels, Mohammad Habeeb travelled all over the world through books, and he says that novels were always the best guides. Through his work in translation, he came to realize that, “recreating what others have written is more difficult than writing it yourself”, and to be prepared for criticism rather than compliments. Habeeb stresses the importance of being “faithful to the artistic touch” of the author, as opposed to one’s own, and being skilled enough as a translator to allow the author’s creativity to flow through the translator’s hand. In August, 2015, Mohammad Habeeb and his family arrived in Stavanger, a city of refuge through the ICORN program, where they currently reside. Habeeb recollects the time when Syria was his home, and the rest of the world was rooms within that home; “Syria was, and will always be, the closest and warmest room, here, or in any other land”, though often he compares Norway to a “friendly, loving second mother”. Habeeb’s new home and new situation have pushed him forwards, and brought him to reflect in more open and sincere communication with others. He feels encouraged to share his opinions on the reality of the situation in Syria, and particularly the emotional and psychological effects the political climate has on its citizens. Habeeb is now in a position rife with new opportunities, but he aptly notes that “having all the possibilities is just a step”; it is what one does with possibilities, rather than merely possessing them, that counts, and Habeeb plans to take full advantage. From the time Habeeb learned he was coming to Norway, he asked himself how to make use of his new life, and his instinct told him the answer was to delve into a new project, to have a goal to propel him forward in Stavanger. He decided that his main focus would be learning Norwegian and creating a new bridge, both for himself and in the world of translation, between Norwegian and Arabic cultures. He began ambitiously, working on translations of poetry by Sigbjørn Obstfelder, and reading them in the 150 year Obstfelder celebration during the Kapittel 2016 festival in Stavanger. Habeeb has now moved on to translating his own work, having recently completed a book of short stories, one of which he has translated into Norwegian. Habeeb’s quiet intelligence, skillful writings and translations, and humble demeanour have quickly earned him recognition and respect in his new community. He was recently invited as an honored guest to the Jubilee celebrations in both Stavanger and Oslo, where he met the King and Queen of Norway, and he was recently featured on the television program Brenner og Bøkene.